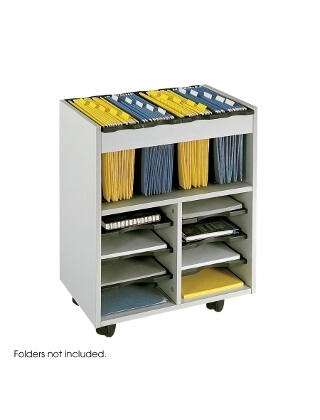 This innovative mobile cart has adjustable literature trays for storing flat materials and tubs for hanging files. Constructed of furniture-grade compressed wood with laminate finish. Includes four removable plastic tubs, each offering 5" of space for letter-size hanging files (not included). Six pullout, letter-size shelves form up to eight letter-size compartments. Mobile on four casters (2 locking).